WS-21 ----------------------------------- July 23 1938. 1928, estimated at 3,996 million bushels. bushels above the world total of a year earlier. some large purchases during the course of the -'ear, which -'culd raise the total. Soviet Russia and China unless otherwise stated. since early June and it seems probable that further declines will be slight. ARE LARGE, AND DOMESTIC PRICES ARE EXPECTED TO CONTINUE BELOW WORLD LEVELS. 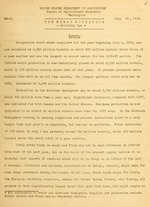 Bureau's first tabulation by countries of estimated 1938-39 production 1/. in southern and central Manitoba, north central Saskatchewan and northern Alberta. harvest in the Southern Hemisphere. 2/ See page 11 for discussion of crop prospects in the United States. devastation. Heavy damage has already occurred over a large area. Italy and Spain show the greatest reductions compared.with .last year. a year ago. The quality of the crop is considered to be fairly good. or 25 million more than the 1937 harvest. at 250 million bushels compared with 185 million last season. really adequate rains have fallen for the past 8 or 9 L:,lWs. year and the quality of the crop is said to be slightly better. Egypt ..... ...... .. .
1/ Based on weather conditions to date. / Estimate of the Berlin Office of the Bureau. / Estimate of the Paris Office of the Bureau. 7/ Estimate of the Belgrade Office of the Bureau. important wheat countries, notably France, Italy and Spain. points in the carry-over series. quantities froi North Africa, is likewise indicated. stocks 1922 to 1937, was published in "Thc Wheat Situation", June 1938, page 14.
may total as much as 2,600,000 barrels compared with 985,000 barrels in 1936-37.
compete for the United Kingdom market primarily with the Danube Basin countries. Austria's former overseas takings will be replaced by European wheat. now seems apparent from the new crop, and one probable move is the building up. 4/ Reported by the Shanghai office of the Bureau of Agricultural Economics. ing of certain quantities for feed and the distillation of wheat for alcohol. trolled markets the setting of the new crop prices is new under consideration. November 1932. 2/No. 2 Hard Winter. with prices in Chicago, Kansas City and Minneapolis. 5/ Domestic wheat prices discussed on page 13 .
low world whe:t prices will stimulate full protection of the local markets. world prices drop to much lower levels. expected to be aniounc..A by tie Canadian .-.,t Board or. atout July 27.
who:t b:.- disposedd of at pricco above thei fixed minimum. for the 5 years 1924-2J, avorageu. about 115 million bushels. the Emn.llest supplies in recent ye-ars. durum 35(42), and winter and spring white 102(86). California. 7ast of the Mississippi prospects in general impro 7ed sliF.htly. ll Kinnesota, North DJkota and South Dakota. South Dakota and eastern Montana. mill and elevator stocks may total about 65 million bushels. .nco of 685 million bushels. dem-,nd in both domestic and foreign mnrkIzts has boon slow. on further domestic price declines. 2/ Conversions at noon buying rate of exchan-,u. 3/ August futures. 5/ August anid September futures. I/ Weekly average of daily cash quotations, basis No. 1 sacl-cd. / April 9 to July 16, 1938 and corresponding dates, for 1937.
: Mil.bu. Mtil.bu. .il.b'i. 1Mil.bu. I/ Includes flour milled in bond from foreign wheat. 2 Broonhall's Corn Trade News. _/ Fort Williajm, Port Arthur, Vancouver, Prince Rupert, and New Westminster. Compiled from reports of the Department of Commnerce. from the United States by weeks are not available. of exports t-hrough 16 of the principal ports. Mil.bu. Mil.bu. : : Mil.bu. Mil.bu. 1/ Net exports. 2/ Net Exports of less than 500,000 bushels. W/ Less than 500,000 bushels. years 1910-15 and acreage abandonment somewhat larger. were much above the 10-year average. year, 48 million bushels in 1936 and 70 million bushels in 1935. Statcs whore rye production is of minor importance. in 1937-38 about 40 million bushels. last year produced more than 65 percent of thet total European production.